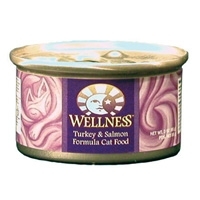 Wellness Canned Turkey & Salmon Formula provides two sources of high quality protein and essential fatty acids. We use USDA Turkey free of added hormones and steroids as well as ethoxyquin-free salmon as a source of protein and long chain Omega 3 fatty acids which are critical for healthy skin and coat, proper body function and enhanced learning. This recipe also includes delicious sweet potatoes and carrots as an excellent source of vitamins, minerals and beta-carotene. Fresh, whole cranberries and blueberries are added to help maintain proper urinary tract health. Created with exceptional palatability, alternate or mix Canned Turkey & Salmon Formula with Wellness Dry food to create a special treat, offer a variety for your cat or supplement additional nutritional needs. No other Cat Diet has a better taste! Made with 100% Human Grade Ingredients. Wellness Canned Diets promote natural nutrition for a Lifetime of Wellbeing we call it The Wellness Way.